On the occasion of the conference "Political & Economic Situation in Southeast Asia: The Case of the Indigenous Khmer-Krom People" held on 2 June 2018 in Paris and of the anniversary of the colonisation of Kampuchea-Krom on 4 June, the Unrepresented Nations and Peoples Organization publishes a report on the human rights situation of the Khmer-Krom people. Living in the Mekong Delta in Vietnam, this indigenous people faces discrimination, isolation and repression due to its religious practices and the activism of some of its members. You can find the report enclosed in this article or download it here. On 2 June 2018, the Khmers Kampuchea-Krom Federation (KKF) together with the UNPO convened a one-day international conference at the French Senate in Paris. The conference was the occasion to raise awareness of the situation of the indigenous Khmer-Krom people. Published on the occasion of this event and that of the anniversary of the colonization of Kampuchea-Krom on 4 June, the report first depicts the historical background of the Khmer-Krom people and the challenges it brought about for it. This ethnic minority lives in the Kampuchea-Krom which literally means “Lower Cambodia”, a land that they have considered as their ancestral home for over 2,000 years, an argument that is being ignored by Vietnam despite the recent findings of archeological evidence. The Vietnamese government has several reasons to repress the Khmer-Krom people. Firstly, they have been fighting alongside the French army and their territory was given back to Vietnam without any consultation or consideration of their rights on it. Secondly, in 2007, major protests by Theravada Buddhist Khmer-Krom monks ended up in a bloodbath and the arrest of numerous protesters. These two events marked and fostered the beginning of a long-lasting repression fed by the economic interests in the region, the religious differences with the national government and the fear from the latter of seeing a divergent and influential political force emerge. This attitude resulted in the resistance of the Khmer-Krom people that not only gives Vietnam justification for its actions, but also deepens the discriminations from the main ethnicity, in parallel to paradoxical and heavy assimilation campaigns. These assimilation campaigns mostly consist on a daily basis in religious repression and severe restrictions of their individual and collective freedoms. For instance, every religious group has to register through a governmental organ, which facilitates the control of their activities and their expansion potential. The Khmer-Krom culture is also a major target of these repressing policies as they are not allowed to use nor teach the Khmer language. The Vietnamese government keeps reinforcing the surveillance of the Khmer-Krom Buddhist monks that they corrupt or pressure to incite them to report any suspicious activities. Moreover, authorities have no consideration for the Khmer-Krom religious norms as they do not hesitate to defrock monks that they consider as threats. More concretely, authorities can use violence to suppress protests or attempts to raise awareness about their cause and they can arrest monks and activists without any notice nor trial and sentence them to jail. The Khmer-Krom people not only suffer under local repression from the Vietnamese government, but they are also the victims of a lack of recognition from the international community. This seems unfair regarding the implication of France and the United States in conflicts that took place in Vietnam and during which the Khmer-Krom were instrumentalised. 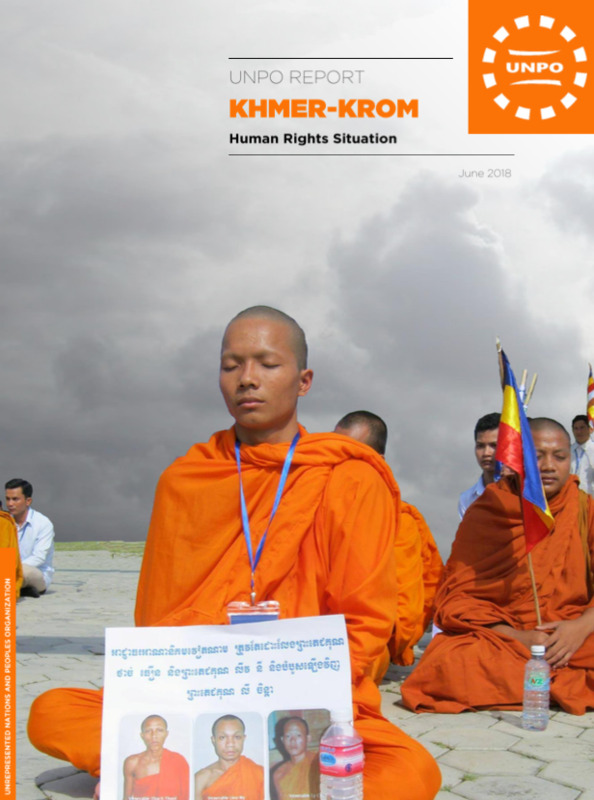 By publishing this report, the UNPO stands behind the KKF and hopes for more recognition, more awareness and a shift in the attitude of the Vietnamese authorities towards the Khmer-Krom people.